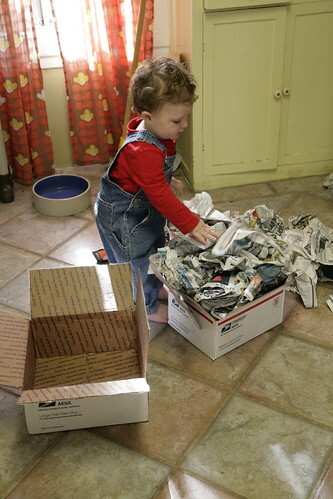 Inder Loves Folk Art: Look what the mail lady* brought! *Steve says the politically correct term is "mail carrier." 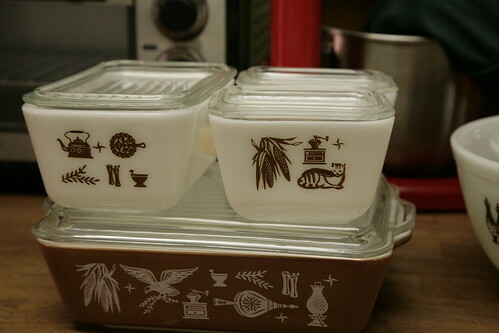 Early 1960s Pyrex refrigerator dishes! In the Early American series. I chose this series on eBay because it was the cheapest I could find because it's TOTALLY AWESOME! Joe likes that the pattern includes (1) a cat; (2) a rooster. Incentive to make animal sounds is always a plus in Joe's book. And, what is this? I seem to have bought a matching set of nesting mixing bowls? Ahem. Oops. Step away from the eBay, Inder. Step away. Joe's favorite part was the packaging. Which was excellent, by the way. After the mail lady handed me these heavy boxes, I turned around, stepped back into the house, tripped, fell, and ate hardwood. 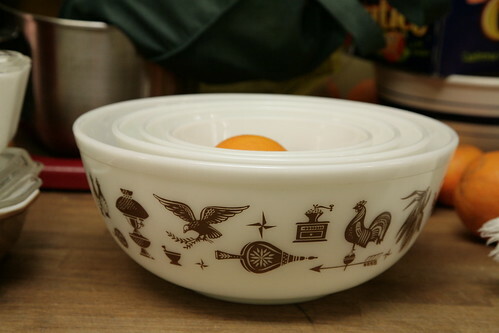 But the Pyrex was fine. Whew!